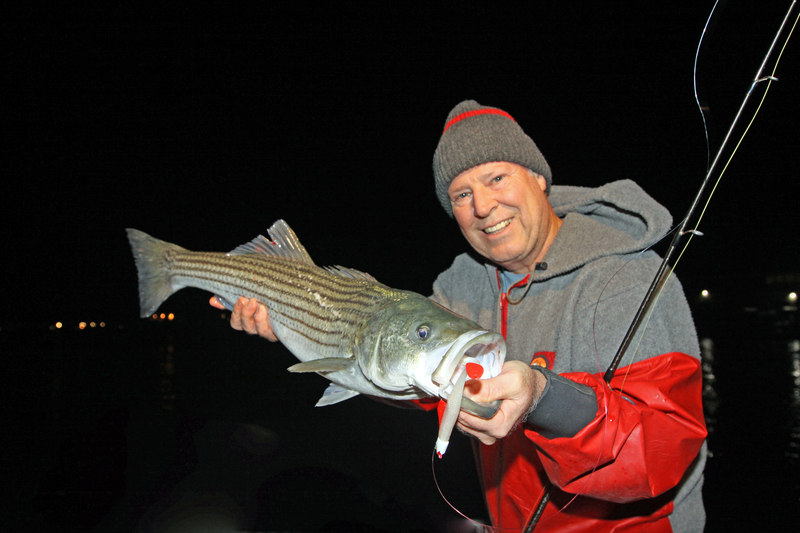 Tidal creek stripers are an early spring and late fall treat. This one slammed a Panther Martin Big Fin paddle tail for the author. OutdoorTom.com photo. The month of May can be a magical time for Northeast and mid-Atlantic anglers. 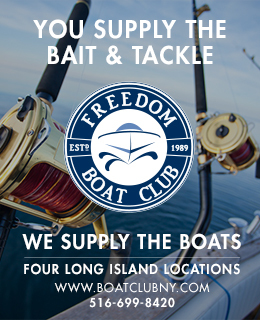 The freshwater lakes are bursting with action, doormat fluke are putting in their initial appearances, and the first keeper stripers begin making news from northern New Jersey to southern Massachusetts. All of this is headline-grabbing action and I have to admit it draws me in every year. Yet, there is another kind of fishing I cherish come springtime, one that is more quiet, less pressured and closer to home. 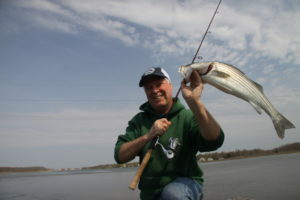 It’s light-tackle tidal creek fishing for stripers, and I never fail to mix in several trips no matter what the headlines scream. Up and down the striper coast small tidal creeks etch themselves across the map, snaking their way into the mainland from bays and harbors or even larger bodies of water like Long Island Sound. Early season stripers love to visit these waters and offer a ton of light-tackle catch and release potential. With striper stocks in good shape at the moment, there seem to be plenty of fish to fill in these flows. The 2015 year class was really solid and makes up the bulk of the fish you’ll encounter, but you’ll find some 2011 year class representatives, too, and those fish are now of keeper status. Last year alone, I drilled stripers from May into early June at more than a dozen locations, and the action sometimes bordered on the furious. I’ve had 30– fish nights and caught bass until I thought my arms were going to fall off in the middle of the day under cloudy skies. There have been times that this tidal creek fun has rivaled that of the fall, at least from a numbers standpoint. Now, to be sure, most of this fishing centers on schoolies measuring 16 to 24 inches, but you will connect with an occasional keeper if you stay at it, and I’ve pulled a few fish weighing between 12 and 20 pounds from these shallow-water hide outs. As a rule, this is light-tackle fishing for light-weight linesiders but on ten- to 12-pound test spinning gear – or even a six-weight fly rod – these fish can really be a blast. 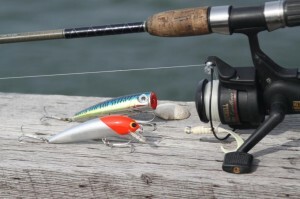 Freshwater bass fishing tackle is a perfect match to this kind of fishing. While tidal bassing might not hold the interest of a die-hard trophy hunter for more than a trip or two, it is a great way for novice anglers to begin to learn the ways of the striper, and it makes a great entry point for introducing youngsters to the fishing game, especially with the emphasis on returning your catch to the sea. The key to finding bass in your local tidal creek is to locate the bait. Rain bait, sand eels, spearing and the like pile into some creeks on rising tides while seemingly avoiding others. Find the creeks with the most bait and you will probably find the bass as well. To locate the bait, you’ve got to scout. One way that works great is to cruise these areas after dark, by boat or by foot, checking shadow lines and lighted sections on calm nights. If the shiners are present, you’ll see them schooled up in lighted areas, perhaps even dimpling the surface. Look for baitfish to also be tightly schooled around bends and near the mouth of any creek just inside of where it connects with open water. The more productive creeks will also hold shad early in the season and you can bet that any spot featuring these larger baitfish will also hold schoolies, cocktail blues and, possibly, a few keeper stripers and weakfish. Shad-infested areas are a great place to begin prospecting for bass as the schoolies and big silver minnows often target the same bait sources. Because most tidal creeks are relatively shallow, you’ll want to hit these fishy hot spots at first light, dusk, after dark or under heavy cloud cover. Even small stripers tend to shy from direct sunlight and this can be especially so during the early season before plankton blooms begin to cloud the water. Trying to stay out of the sun also leads the stripers to the deepest holes up tight against structure. Look for drop-offs in creek bends or pinch points with plenty of shade, such as those created by bridges, and you should stumble across more than a few fish. Another important consideration in finding creek bass is tidal stage. 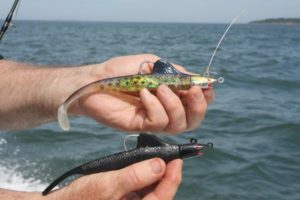 Generally speaking, the start of outgoing water produces best because it begins to pull baitfish and grass shrimp from the shallows and ushers them into the main channels to create a giant chum slick. Put the right tidal stage together with plenty of bait, add low low-light conditions, and you’ve got the ingredients for some explosive fishing. Small poppers, plugs and soft-plastic grubs are ideal for tempting tidal creek bass. Photo by Tom Schlichter. Tidal creek stripers typically run 16 to 20 inches and are perfect match for light spinning gear. OutdoorTom.com photo. Because the waters can move swiftly around bridges and pinch points, these are good places to try tins, round-head bucktails and soft plastics impaled on lead heads such as a small Fin-S-Fish, Storm WildEye Shads or one-ounce Panther Martin Big Fins. If working from a boat, try casting bucktails tipped with red, yellow or white Fat Cow Teasers slightly up-current from the target. From shore, quarter your casts up-current, then allow the lure to sink and come about before working it slowly toward the beach. From either boat or shore, be certain to keep your offering a foot or tow off the bottom unless you see the fish breaking or cruising on top. During the evening hours, you might find a popper works well up tight against the marsh grass and phragmites that border many creeks, especially if the water is calm. Some sharpies combine the attractive splash of a popper with the appeal of a bucktail to produce quality scores. This is easily accomplished using a snapper-popper. Replace the leader with a three-foot length of 30-pound test monofilament line and tie on a one-quarter-ounce bucktail or soft-plastic impaled on a small jig head. Work the snapper popper like a surface plug. The bass are drawn to the sound of the popper but generally find the small bucktail more enticing. During daylight hours I like to probe most creeks with one-ounce Panther Martin Big Fins, small WildEye Shad, Fin-S-Fish or a 5-inch Berkley Gulp! Swimming Mullet impaled on one-quarter-to one-half ounce white or chartreuse bucktail. After dark, my preferences change to four-inch, white, Mr. Twister Tails on one-half-ounce jig heads and five-inch chicken-scratch swimming plugs worked just fast enough to keep the line tight. On a full moon, however, I might work a small popper along the lines of a white Super Strike Little Neck or one-half-ounce Creek Chub, especially if I hear or see schoolies splashing on the surface. Panther Martin Big Fins are a great lure for stripers at any time of the year. Photo by Tom Schlichter. Any good map, internet or print, will show most tidal creeks. If you are new to the creek you plan to fish, be sure to do a bit of prospecting during daylight hours before ever thinking of making a late-night trip. This is best accomplished at dead low tide, the primary reason being that any place you can get into and out of at this tidal stage will be safe to fish on rising water, and the secondary reason being that any holes you find at this point are going to be quite significant at the start of outgoing water. The time to get out and experiment with tidal creek bassing is now. If you live anywhere near the coast there are probably several possibilities within a reasonable drive of your home. Just be sure to realize that no creek is too small – and any place that appears to be fishy is worth a second look even if you don’t score on your initial visit.